When a current-carrying conductor is placed in a magnetic field, the conductor will experience a force. This effect on the conductor is called the Motor Effect. Magnetic field from magnet interacts with the magnetic field due to current in the wire. A combined magnetic field is produced which is stronger at region A and weaker at region B. A force then acts on the wire from the stronger field to the weaker field. 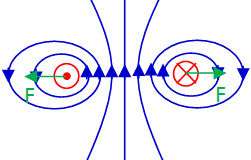 Magnetic fields due to currents in both wires will interact resulting in a combined magnetic field. A weak field exists between the two wires while a strong field exists on the left and right of each wire. A force is thus produced on each wire from the stronger field to weaker field. Thus the wires attract. Magnetic fields due to currents in both wires will interact resulting in a combined magnetic field. A strong field exists between the two wires while a weak field exists on the left and right of each wire. A force is thus produced on each wire from the stronger field to weaker field. Thus the wires repel. Like currents attract, Unlike currents repel. Besides using the Interaction between magnetic field method, we can actually determine the direction of force easily by means of Fleming’s Left Hand Rule. Fleming’s Left Hand Rule states that the direction of force (indicated by Thumb) is ﻿perpendicular﻿ to both the direction of magnetic field from North pole to South pole (indicated by Index Finger) and the direction of current (indicated by Middle Finger). We must not mix up the fingers and their represented terms. To help us remember this rule better, we can memorize it as Father, Mother, Child, where F is Force (thumb), M is Magnetic Field (index finger), C is Current (middle finger). If the direction of current is parallel to direction of magnetic field, there will be NO force produced. The magnitude of force is maximum when the direction of current is ﻿perpendicular﻿ to the direction of magnetic field. The figure below shows a light aluminium rod resting between the poles of a magnet. A current is passed through the rod from two brass strips connected to a power supply. (a) On the figure, draw the direction of the current in the rod when the switch is closed. (b) State which way the rod moves when the switch is closed. Give a reason for your answer. (ii) the current is reversed. (b) The rod moves in when the switch is closed. By Fleming’s Left Hand Rule, the direction of force (indicated by Thumb) is perpendicular to both the direction of magnetic field from North pole to South pole (indicated by Index Finger) and the direction of current (indicated by Middle Finger). When answering this kind of question, always remember to state the fingers! When the switch is closed, current flowing through the rod and producing magnetic field around it. This magnetic field interacts with the magnetic field from the magnet, which result in a combined magnetic field which is stronger outside and weaker inside. A force then acts on the rod from a stronger magnetic field to a weaker one, and hence the rod moves in. Both answers are acceptable, but using Fleming's Left Hand Rule is easier to explain this. (c) (i) When the current is increased, the rod moves faster. In Current Electricity, we have learnt that current is defined as the rate of flow of charge. The direction of movement of ﻿positively charged particle﻿ is ﻿﻿same﻿ as the direction of current﻿ while the direction of movement of ﻿negatively charged particle﻿ is ﻿same as electron flow﻿, which is ﻿opposit﻿e﻿ to the direction of current﻿. ﻿By Fleming’s Left Hand Rule, current in coil section AB causes an upward force to act on AB and current in CD causes a downward force to act on CD. This produces a clockwise turning effect. These two forces are same in magnitude but opposite in direction. No force acting on BC and AD as the direction of current is parallel to the direction of magnetic field. When the coil has rotated through 90°, opposing forces ‘cancel’ each other out and the coil continues to rotate pass through the vertical position due to inertial. When the coil passing through vertical position, the force acting on AB is still upward while that acting on CD is still downward. Hence, the coil rotates anticlockwise now. As a result, the coil would reverse its direction of rotation whenever it passes through the vertical position until it stops as it always experiences an opposing moment when passing through vertical position. The coil does not rotate continuously. The wires are entangled while rotating. How to solve these problems will be discussed in d.c. Motor with the use of Split Ring.